With The Muppets hitting theaters this week, a new generation of children will learn the Way of the Pig. And I couldn't be more thrilled. Miss Piggy was one of the most important influences on my childhood development, and I think she's got quite a bit to teach us all about life. Plus, she gets to go into spaaaaace! On paper, Miss Piggy seems a bit unlikable. She's emotionally needy and desperate for Kermit's love, to the point of harassment. She's bold and ego-centric, vain and thick-skinned to the point of delusion. And I love every scrap of it. 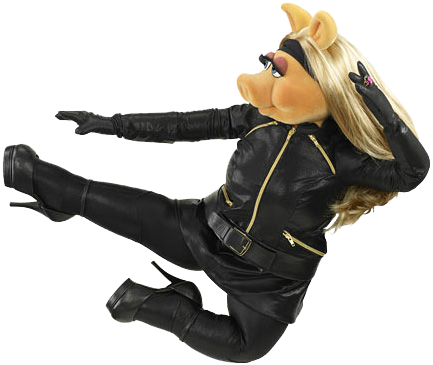 You see, Miss Piggy has unshakable self-confidence. Her clothes are impeccable, her eyelashes are sumptuous, and her hair is a glorious swirl of blond curls. She's a diva who doesn't fit the cookie-cutter mold of scrawny womanhood I saw in other (more human) glamour girls growing up. As a child, I marveled at how sure of herself she was, and how she gloried in the slinky dresses and elbow-length opera gloves that embraced her curvy, Muppety body. Bluntly, she's a bit on the plump side, but it doesn't stop her from carrying herself like the most creature in the room. In an era that celebrates waif-ish twig women, Miss Piggy has a remarkably healthy self-image. Most importantly, Miss Piggy goes out and gets what she wants. Her self-confidence spurs her to action. She wants to be with Kermit? She chases him down and convinces him he can't be without her. She wants to be a star? She pursues her dreams on stage, regardless of the negative feedback she receives. She doesn't get the respect she deserves? She tells people that they will respect her. It never occurs to her that she's not worth it or that she won't get it. And by golly, she gets their respect, and she gets her frog. Even as a child, I recognized that everything about Miss Piggy was larger-than-life: her ego, her hair, her clothes, her pursuit of the meek Kermit. And yet the lessons she taught me were no less valuable because of their outsized spokes-pig: Be confident in who you are. Wear what makes you feel beautiful. Decide what you want in life and go after it. Don't let other people make you feel worthless. Demand respect. Embrace love. Be the star of your own life. Just maybe ease off on the karate chopping. I remember seeing the Raquel Welch episode where she and Miss Piggy sing a duet. Yes, Miss P owns it! Can't wait to take my kidos to see the new Muppet Movie. 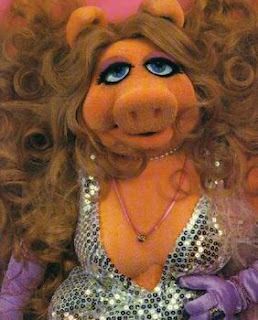 I love Miss Piggy for the same reasons! 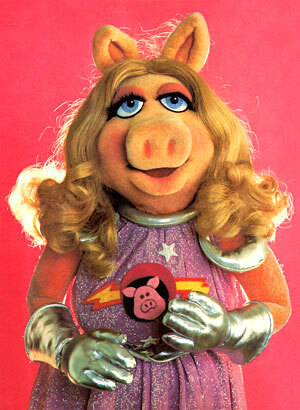 I'm a chubby girl and was when I was growing but Miss Piggy proved that you could do anything you wanted to. She was also a good example that it was okay to want your dream job and still want a family in a time when it seemed like it wasn't possible. She showed that you can be with someone who wasn't the biggest and the baddest guy around because he loved you for you. Miss Piggy is awesome!